Latkes and Jelly Bellies: Fairfield factory hosting first Chanukah Wonderland – J.
Chanukah Wonderland at the Jelly Belly factory’s visitor center may initially sound like any Chanukah gathering — latkes, menorahs and revelry — but there are a couple of key differences. Namely, 100 pounds of Jelly Belly candies and the costumed Mr. Jelly Belly mascot dressed like Judah Maccabee. So perhaps Chanukah Wonderland will be a tad sweeter then the usual holiday party. The event, which takes place Wednesday, Dec. 8, the last night of Chanukah, is the result of an inspired collaboration between Chabad of Solano County and the Fairfield-based candy company. The free event includes the lighting of a giant Jelly Belly–filled menorah made of clear PVC pipe. Zaklos said the company CEO Herm Rowland and his daughter Lisa, along with Fairfield Mayor Harry Price, planned to be on hand to help light the candles. There also will be four different types of latkes (including sweet potato) by chef Glen Sheron, along with an olive oil tasting and pressing demonstration by the owner of Corto Olives. All the food at the event will be under rabbinical supervision. Jelly Belly was certified kosher by the Orthodox Union a couple of years ago, which has drawn a lot of interest from the Jewish community, said Tomi Holt, director of communications for Jelly Belly Candy Company. The company also will provide free tours of the expansive factory. Founded in 1898 as the Herman Goelitz Candy Company, Jelly Belly, as it’s now known, has operated a factory in Fairfield since 1986. In the visitor center, the Ferris Wheels will provide live music and a storyteller will explain the Chanukah tale while strumming a guitar. Attendees can have their picture taken with Mr. Jelly Belly as Judah Maccabee and create edible menorahs out of different Jelly Belly candies. “We wanted it be geared toward Jewish children and get younger families into the loop,” said Zaklos. Zaklos knows this demographic well — the 28-year-old Chabad rabbi has a 17-month-old daughter, Chaya, and another child on the way with his wife, Aidel. The young family moved from Brooklyn, N.Y., to Vacaville last year after learning about the area through Chabad rabbis in Pleasanton and Napa. 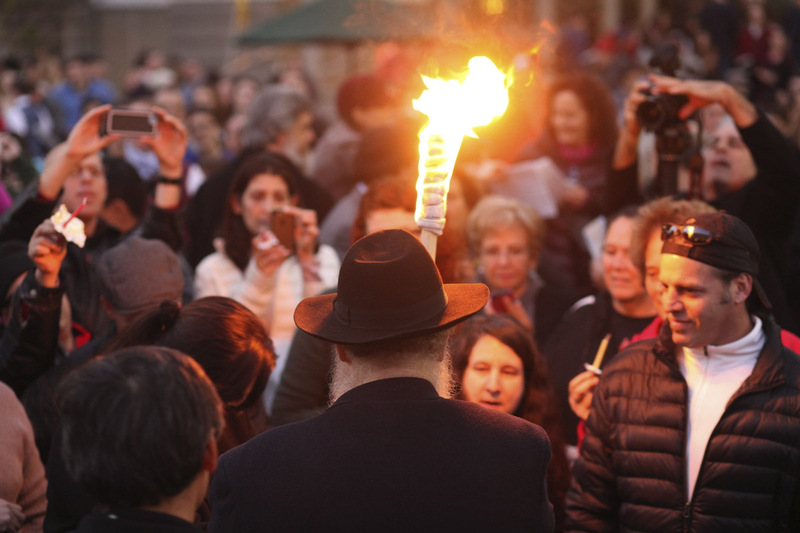 Since starting Chabad of Solano County last fall, Zaklos says they now have a core group of about 150 families who attend synagogue, get involved with activities and assist with holiday event planning. When Zaklos visited Jelly Belly last spring to propose a Chanukah event at the factory, he said he was met with enthusiastic responses. While the factory gets about 5,000 people on tours each year and has hosted a Christmas tree event for more than a decade, this marks its first Chanukah party. “[Jelly Belly] said, ‘we’re excited about this, we have a Christmas event every year’ then asked if we’d be interested in holding the Chanukah party every year too,” said Zaklos. If the turnout is good, Zaklos does plan to make the Chanukah Wonderland Jelly Belly event an annual tradition. He says he expects around 500 people but can host up to 1,000. And if all goes according to plan, perhaps next year they’ll need 200 pounds of chewy beans to feed the hungry Chanukah masses. Chanukah Wonderland is open 3 to 7 p.m. Wednesday, Dec. 8 at the Jelly Belly Visitor Center, 1 Jelly Belly Lane, Fairfield.